Burns supper is an annual celebration of the life of Scottish poet, Robert Burns who’s work is wildly celebrated and known across the world. His poem and song, Auld Lang Syne is probably his most famous piece along with Scots Wha Have which was the unofficial national Anthem of Scotland for many years. Burns Night started 5 year after Robert Burn‘s death in 1801 by a group of his friends, since then this celebration was repeatedly annually. 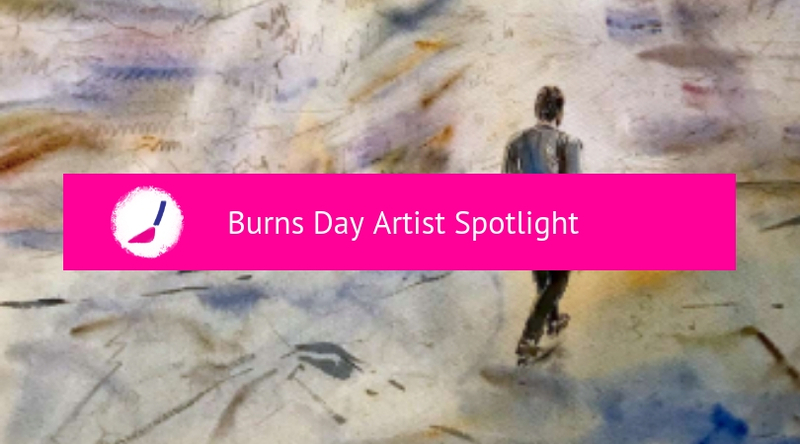 We thought we’d embrace this Scottish celebration and feature some of the best of emerging artists who are either from Scotland or their work is inspired by the beautiful country, or Robert Burns himself. We start this artist spotlight with Scottish artist, Gemma Hare who focuses on conservation and explores Scottish wildlife through her painting. Hare draws inspiration for all her artwork from Scotland’s animals. In this particular series, Gemma focus largely on bees and the importance they are to our eco system Hare states ‘Although the insects I feature are tiny in reality, they are given prominence in my work’ to portray this message. Gemma uses acrylic paint on canvas combined with collage and text transfers. The colours are vibrant with expressive brush strokes. To see Gemma Hare’s full collection of artwork, please CLICK HERE or follow her HERE. We then move on to Joss Cole, a watercolour artist who currently lives and works in London, Cole’s emotive works are inspired by poetry. Joss uses lose, expressive brush strokes to capture the emotions of the poet. 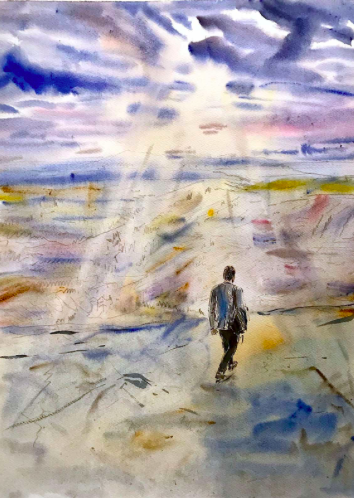 In this painting ‘The Poet’s View of the End of the World’ Cole draws on the concept of a modern Robert Burns making his way to Arthur’s Seat to look over Edinburgh and contemplate his next poem. Everything about this painting gives a sense of calm and tranquility, notice the subtly of the sunlight shining through the separating clouds. To see more of Joss Cole’s beautiful work, please go HERE. We next move on to abstract artist, Katie Beth Avey, who was brought up in Edinburgh and studied in Aberdeen. 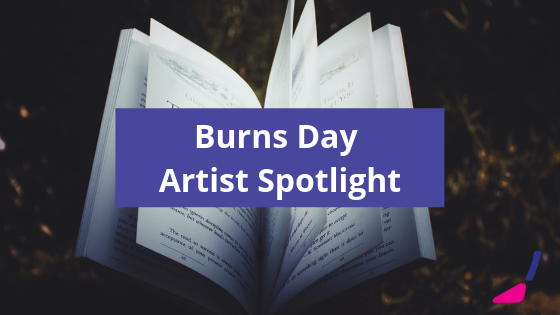 Avey’s works reflect her personal memories of life being brought up in Scotland. 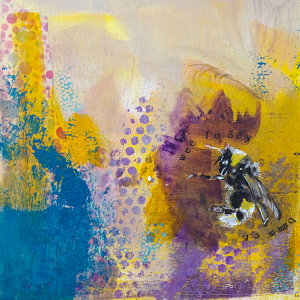 These striking artworks are bold shapes combined with bright colours and are created with mix media on board. 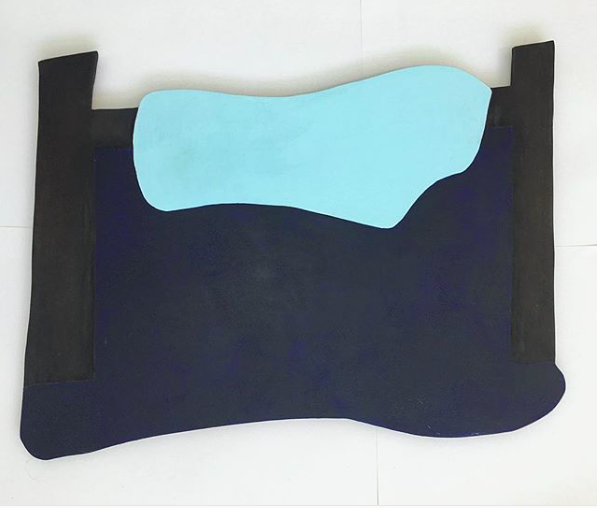 We spoke to Katie about her piece ‘Bunk Beds’ which is an abstract painting created with a sheet of MDF. The dark area of the ‘bed’ is a combination of acrylic and oil paint which has been scratched into. The large blue area at the bottom is oil paint with repetitive spirals which have been scored in while the paint was wet, this time consuming and repetitive motion is reflecting the uncomfortable springs of the old bed frame. We asked Katie Beth Avery to discuss this piece: ‘The painting as a whole reflects the bunk bed set in my Scottish family home, and the memories that came from my family members when they were asked about it. I use time consuming and repetative actions to fully engross myself in the memory and try and depict the feelings that are linked with it.’ . To see examples of Katie Beth Avery work, please CLICK HERE or follow her HERE. 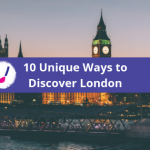 All artists discussed in our Artist Spotlights are emerging, please take the time to follow up on some of the artists you see in these articles and support new talent!